Here was an invitation I could refuse — a tasting of a new “Super Tuscan” blend made from three international grapes from two different regions of Tuscany. I was going to turn it down, when I noticed the invitation came from Andrea Cecchi. Andrea is someone that I have known for many years and respect as a winemaker. 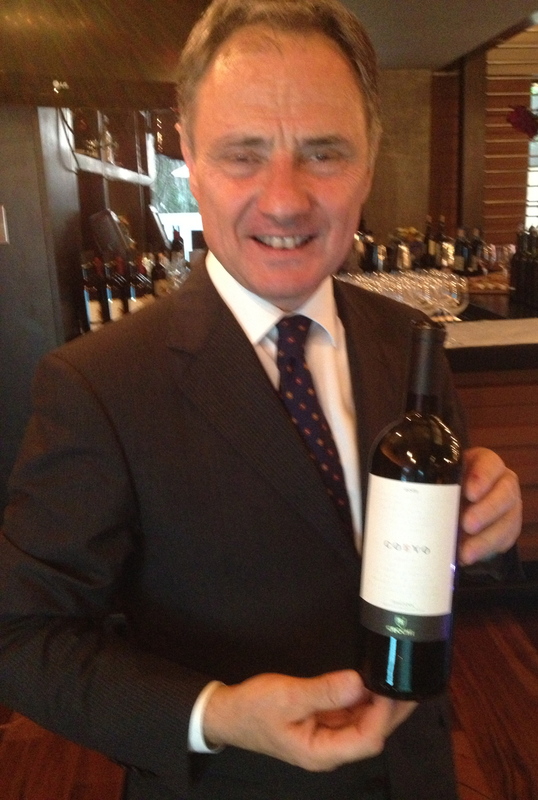 I went to see Andrea and find out what his new wine Coevo was all about. Andrea Cecchi is the winemaker for the Cecchi family estates and with his brother Cesare, runs this family business. Andrea said that even though Cabernet Sauvignon, Merlot and Petit Verdot are used in the blend, more than 50% of the wine is Sangiovese and the wine reflects its Tuscan roots. He had bottled for the tasting each of the four grapes separately so we could taste them before tasting the blend. It was very interesting and my favorite was the Merlot, which had a hint of pepper which Andrea said is a reflection of the terroir. It is very important to him that this wine has a sense of place and that it tastes like where it comes from, Tuscany. Andrea said that the blend is made from 60% Sangiovese, 10% Cabernet Sauvignon, 15% Merlot and 15% Petit Verdot. He said in Castellina in Chianti the vineyards were at 200mt and in the Maremma at 250mt. He explained that the soil and climate were very different in these two regions and certain grapes did better in different zones. There are 5,000 plants per hectare and the vine training is spurred cordon. The grapes are picked by hand, the Merlot is harvested from August 23, Petit Verdot from September 12,Sangiovese from September 25, and Cabernet Sauvignon from October 5. The 2007 is drinking very well, with no sign of vanilla of over concentration, the calling cards of Super Tuscans. It is a balanced, elegant wine with red fruit, violet and earthy aromas and flavors and a hint of pepper. It has a long finish and pleasing aftertaste. The 2009 needs more time but should develop as nicely as the 2007.